OSWEGO, NY – The United Way of Greater Oswego County will hold the 13th annual Stone Soup Luncheon on Oct. 30, at St. Joseph’s Parish Center, 240 W. First St., from 11:30 a.m. to 1:30 p.m.
United Way of Greater Oswego County will host the annual Stone Soup Luncheon on Oct. 30. Deacon Nick Alvaro and United Way Resource Development Director Lexie Wallace meet to discuss plans for the event. All profits and nonperishable food items donated will be distributed to local food pantries. 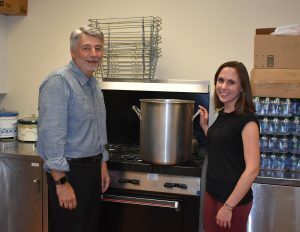 The Stone Soup Luncheon began as a social event to bring together individuals, agencies, and businesses in an effort to increase awareness around hunger in Oswego County. Over the years it has transformed into a fundraiser and food drive that local agencies rely on. The United Way will be accepting a donation of $5 per person, and those attending are urged to bring a donation of nonperishable food items. Those unable to attend the event who would still like to make a donation may call the United Way of Greater Oswego County at 315-593-1900. For more information, visit www.oswegounitedway.org.